Joe is the owner of an IP law firm. His firm is popular among clients for his smart prosecution strategy. His clients claim that he understands the minds of examiners at the PTO and is well aware of their patent prosecution patterns like average actions per patent. But how does Joe know all about it? Is it because over the years Joe prosecuted patents of a particular technology, and with every prosecution, he got familiar with the pattern of the examiners at some art units? Well, this is how experience helps. In general, this is one of the ways an experienced law firm markets itself for having an edge over other firms. This is how a law firm wins the trust of a client by demonstrating that they are the best for handling their application. But was this the secret of Joe’s success, you ask? No. Joe, apart from his experience, relies on some insights for his smart patent prosecution strategies, which gives him an edge. Though there was once a time when Joe relied solely on experience. But then a patent application landed on his desk, which changed the way he handled prosecution. One can say that it was an eye-opener case for him. Want to know what happened? Well, read on. As they say, things change with time for everyone, and it changed for Joe too. His client’s application landed on the table of a new examiner whom Joe had never worked with. As we all know, examiners’ prosecution pattern varies considerably from one examiner to another and from one art unit to another. Joe had no information on the working procedure of this new examiner. He had no idea how many office actions it was going to take and what would work better with this particular examiner. To sum up, the examiner was giving Joe a hard time. It became difficult for Joe to predict the probability of the outcome which he predicted without efforts in the past. When such things happen, you feel like you have lost control of your case (as well as your client). The client who loved Joe because of his ability to predict the outcome beforehand, now expected Joe to deal with the new examiner in the same way. Bonus: Want a 5 step-by-step technique to get your patent granted after an examiner rejects it? Click here to get our free guide! How many office actions this examiner is likely to give before allowance? What works better with this examiner — an interview or an amendment? What type of responses has worked the best in the past with this examiner? What are the chances of the application getting granted if it’s taken to RCE stage? What could be the possible outcome of an interview with this particular examiner? As we said, this was an eye-opening case for Joe. He decided to not let the situation get the better of him. He started contemplating a solid solution and found one. He had figured out the answers to the above questions. No, Joe didn’t have an epiphany nor he used his experience in some other way for sailing the boat through a sea of uncertainty. But he found a really concrete solution. What was that concrete solution? 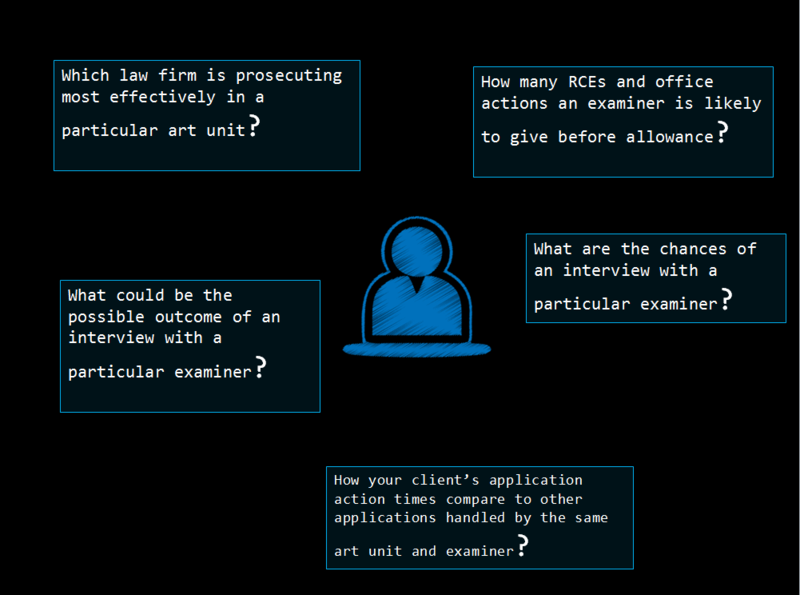 Yes, Joe used actionable Examiner Analytics that helped him craft a smart patent prosecution strategy. Are you still wondering what Joe did or used? Time to pull the curtains. 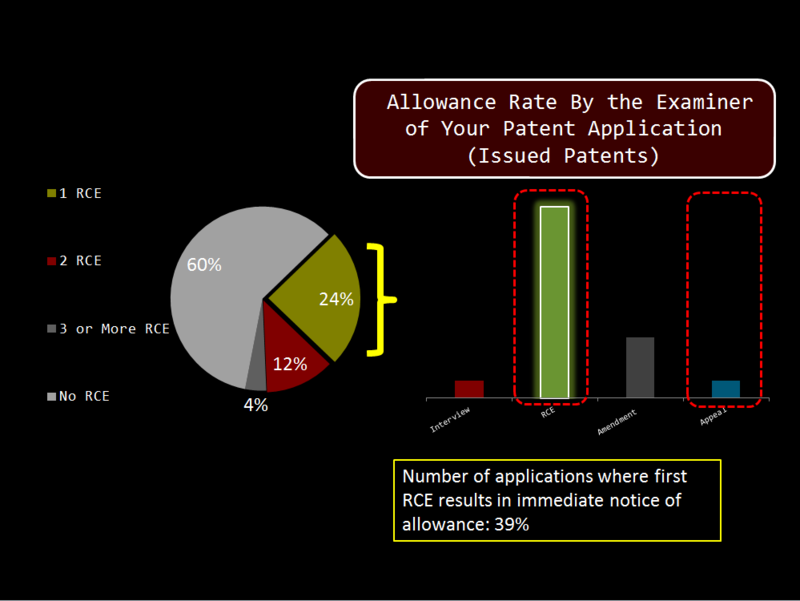 To provide you an idea, there are patent examiners who have an average of 1.2 office actions per allowance and there are examiners, from the same art unit, that have an average of more than 4 office actions per allowance. Knowing which of these patent examiners Joe is dealing with gives him an edge. Many other such categories of information help Joe understand and predict the prosecution pattern of an examiner. For example, Joe knows whether he is dealing with a patent examiner who never issues a patent without filing an RCE, which is handy information. Joe eliminates such guesswork from the patent prosecution process and secures patents more efficiently for his clients. Why do his clients love him? Because he gets them patents issued in the most economical and predictable way. Are you also thinking of weeding out the guesswork? You know what to do.